When on holidays, pleasurable puttering is a great occupation. Why rush when there's so much to see. Assuming that you've spent the night in Annapolis Royal, your journey of discovery should begin by driving through Granville to the Fundy Shore. Don't worry. You can't get lost and you'll have a lot of fun. Some of the best rural and maritime landscape can be found along the shore road from Parkers Cove through Youngs Cove, Phimneys Cove, Hampton and St. Croix Cove. You'll have to turn inland a bit to Outram, then back to the shore at Port George and on to Margaretville. Travel inland again to meet #221 then take side trips to the Fundy shore again to see Morden and Harbourville. 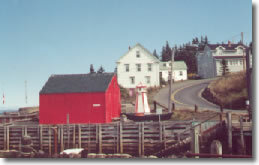 Turn north on #359 to visit Halls Harbour. 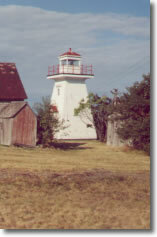 Landscapes include abandoned homes, lighthouses, gorgeous vistas - all great for picture taking. 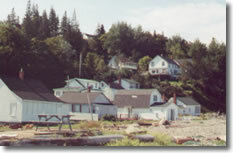 Hall's Harbour is one of the prettiest working fishing villages on the Bay. Like most other little communities, the harbour has an interesting history. Samuel Hall and a band of Yankee rogues once called the area home. Pirating forays launched from the sheltered cove resulted in lots of stolen booty. Legend has it that treasure is still buried on the beach. Hall's Harbour was the boyhood home of "Bucknam Pasha" the last Grand Admiral of the Ottoman Fleet. The harbour's cobblestone beach is a rock hound's paradise. Remember, when beach-combing, be alert to high tides, tidal changes and crumbling unstable bluffs. Try a "pick-your-lobster and eat em" meal at Hall's Harbour Lobster Pound. It is difficult to get lost between the highway and the Bay of Fundy. Diversionary pleasures are worth every minute spent exploring area byways. Tiny working habitations along the Fundy shore are unpretentious, and have a friendly noncommercial environment. There's no "polish & spit" tourism such as one sees along the eastern seaboard of the U.S.A. These enclaves represent genuine, down-to-earth maritime landscape and Nova Scotia hospitality. You take em "as is" and have fun doing so. If you haven't time for side-road exploration, Highway #221 is a good alternative route. 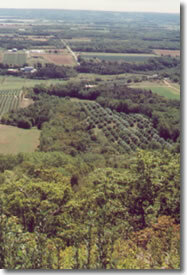 Driving east on Highway #221 toward Windsor and the valley, apple orchards and red soil begin to make an appearance. The Annapolis Valley is famous for apples, in particular the Gravenstein variety. Peaches are grown in the area. Grapes have been introduced and a number of wineries established, one being the "Domain of Grand Pre" just outside Wolfville. Serious hikers drive to the end of #358, park at Scot's Bay and spend the day trekking to Cape Split. The two-hour hike ends with magnificent views of Cape Split on the left and Minas Basin on the right. Turbulent tidal-rips are seen from the Cape Split highlands. Time your hike for midpoint of the incoming tide. From the heights you can often hear the "Voice of the Moon". Remember that those who hike to Cape Split, must hike back again. When finished at the Look-Off, follow signs for Blomidon Provincial Park. The drive down the bluff takes you toward the shore of Minas Basin. Then follow signs for Prescott House Museum & Gardens, known as Acacia Grove. The road putters along the tidal basin and through commercial orchards for a few miles. Watch closely for signage as there's never much posted and it's unobtrusive - no glaring billboards here. 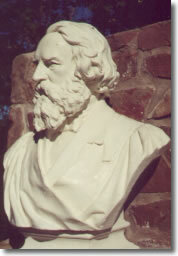 Charles Ramage Prescott, the father of the Nova Scotia apple industry, built Acacia House near Port William in the early 1800's. Charles was instrumental in introducing different varieties of apples to the Annapolis Valley. 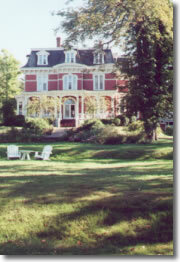 Acacia House was restored after 1969 and is open to the public. Back on Highway #1, you'll have to negotiate the stripping and malling in New Minas before entering the town of Wolfville, an ideal community to spend a day or two. 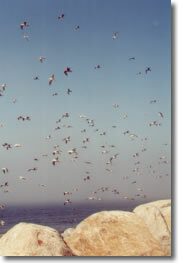 Accommodation can be a problem during high season, so book well in advance. Three-storey c1884 Blomidon Inn is a full-service facility in the finest tradition which includes fine dining and afternoon tea served to guests. The Inn also comes with its own "live-in" ghost, said to be the daughter of a former owner. Wolfville is one of the prettiest university towns in Canada. It's a sophisticated, vibrant community, hopping with students, art and craft studios and a vibrant main area. Restaurants such as Paddy's Brew Pub & Rosies Dining Room serve good food at reasonable prices. Wolfville is located on the southern shore of theMinas Basin where there can be a difference of up to fifty-two feet between low and high tides. Wolfville's small harbour empties completely during low tide. Best views of tidal fluxuations can be seen from Hantsport Wharf. 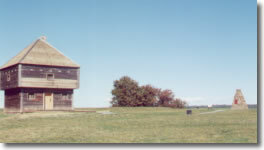 Grand Pre, a short drive east of Wolfville is the location of the Grand Pre National Historic Site. Grand Pre means Great Meadow. The site commemorates the expulsion of the Acadians from the area in 1755. Acadian history at Great Meadow goes back to the beginning of the 17th century. In total 10,000 people were removed from their lands. 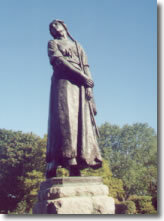 After Henry Wadsworth Longfellow immortalized a fictional heroine in his c1847 poem, Evangeline, A Tale of Acadie, a renewed interest was shown in Acadia and the Grand Pre area. 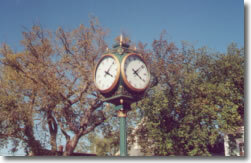 The park was begun in 1907. It has a lovely setting with views over acres of dyked marshlands. Well-kept grounds include flower gardens, a statue of Evangeline, bust of Longfellow and a Memorial Chapel with an excellent visual interpretation of the 1755 expulsion of Acadians. From Grand Pre it's a short drive through Hantsport to Windsor, known as the birthplace of hockey and home to the world's largest pumpkins. Long Pond in Windsor, is said be where the first hockey game was played, hockey being a derivative of the Irish word "Hurley" which was a summertime game. In 1844 Thomas Chandler Haliburton wrote of his c1800 early years at Kings College School -"with noisy boys racin' yelpin' hollerin' and whoopin' like mad with pleasure . . . with games at base in field or hurley on the long pond ice"
Long Pond is located on Howard Dills' Pumpkin Patch property. 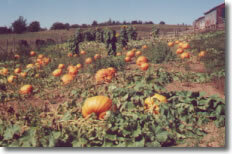 Howard has won world championships for his humongous squash and pumpkins. Dill's famous seeds are shipped worldwide. Not to be missed is the unique Windsor Pumpkin Regatta, held each year in October. As the First Agricultural Fair was held in Windsor in 1765, it's natural that Mr. Dill should establish such an excellent agricultural pursuit in the area. Windsor was home to Thomas Chandler Haliburton. 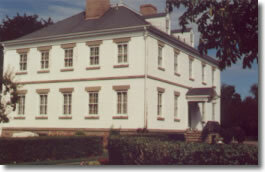 His c1840 home "Clifton", now a part of Nova Scotia Museum, was built in Georgian Romantic architectural style. Haliburton is best known for his "Sam Slick" character. "Sam" was responsible for introducing to the English language sayings such as "its raining cats & dogs" - "he drank like a fish" - "as large as life and twice as natural" - "the early bird gets the worm". Windsor's "Sam Slick" Days, held every August, are chock-a-block full of all sorts of family oriented activities. Guaranteed that you've never seen a home like "Clifton"! It's a must-see attraction. Windsor also boasts the c1750 Fort Edward Block House, the oldest original military structure in Canada. The names of some of the earliest soldiers are carved into its wooden walls. Flora MacDonald, of Bonnie Prince Charlie fame, spent the winter of 1779 at Fort Edward, after being exiled from the Carolinas, and before returning to the Isle of Skye. Other Windsor attractions include the Victorian Shand House Museum, Hockey Heritage Museum and Mermaid Theatre. To have an enjoyable time on the eastern reaches of the Evangeline Trail there are a few things you should keep in mind. If you plan to "side-road" stop at a grocery store for the makings of a picnic lunch. Restaurants and public restrooms don't exist in many tiny shoreline habitations. Be sure to check opening times for attractions. Many close mid-September or operate on reduced hours during shoulder and off-season. Remember too that you can't do much recreational shopping on Sundays in Nova Scotia as retail outlets are closed.